Swim Bladder, also called air bladder, is an expandable gas-filled sac that helps many bony fishes to control their buoyancy in order to stay at their current water depth without having to waste energy in swimming. 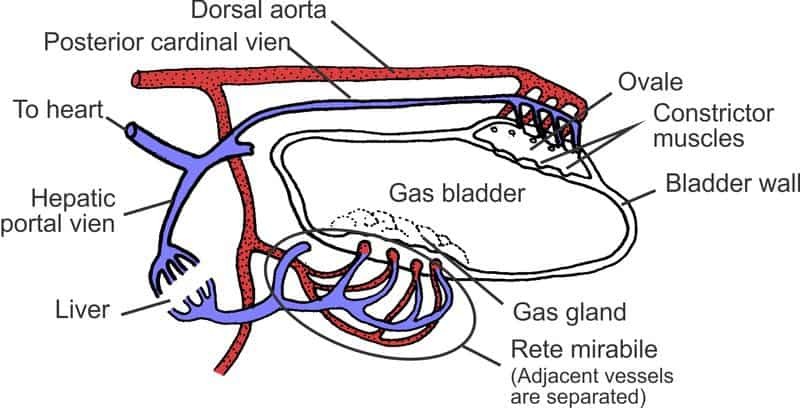 A swim bladder is similar to a lung in structure and function in some primitive fishes, but it is not a lung because most cases its primary role is not respiration. The swim bladder normally consists of two gas-filled sacs located in the dorsal portion of the fish, although in a few primitive species, there is only a single sac. It is an endodermal outgrowth from the esophagus shortly behind the pharynx. This organ usually opens by a pneumatic duct into the esophagus through an aperture called glottis. 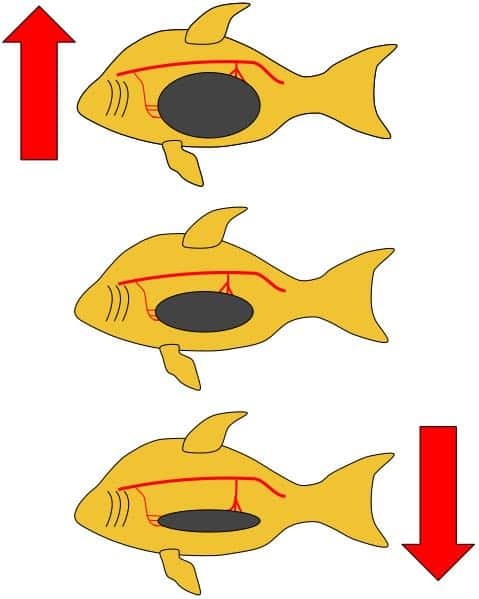 A well-labeled drawing of the swim bladder in a bony fish. It has flexible walls that contract or expand according to the ambient pressure. These walls of the bladder contain very few blood vessels and are lined with guanine crystals, which make them impermeable to gases. The swim bladder is missing in some bottom-dwelling and deep-sea bony fish (teleosts) and in all cartilaginous fish (sharks, skates, and rays). All physiologists admit that the swim bladder is homologous, or “ ideally similar,” in position and structure with the lungs of the higher vertebrate animals. Hence there seems to me to be no great difficulty in believing that natural selection has actually converted a swimbladder into a lung, or organ used exclusively for respiration. I can, indeed, hardly doubt that all vertebrate animals having true lungs have descended by ordinary generation from an ancient prototype, of which we know nothing, furnished with a floating apparatus or swim- bladder. Swim bladder in a fish known as Abramis brama. Darwin reasoned that the lung in air-breathing vertebrates had derived from a more primitive swim bladder, but scientists now believe that the swim bladder derived from a more primitive lung. The swim-bladder in fishes performs various types of functions. It is primarily a hydro­static organ and helps to keep the weight of the body equal to the volume of the water, the fish displaces. It also serves to equilibrate the body in relation to the surrounding medium water at any level by increasing or decreasing the volume of gas content. In many fish­es, the swimbladder is reported to function as an accessory respiratory organ. Circulation of blood is modified to discharge this function. The network of blood capillaries covered by a single layer of epithelium apparently facilitates the diffusion of gases between the blood and the swimbladder. Notopterus is able to survive for long periods in foul water (oxygen deficient) if allowed to reach the surface to gulp in the air. There is a regular exchange of gases between the cavity of the swimbladder and the exterior. By adjusting the volume of swim bladder, the fish can ascend and descend to a large range of depths. By adjusting the gas pressurizing organ and using the gas gland or oval window the fish can obtain neutral buoyancy and ascend and descend to a large range of depths. Moreover, due to the dorsal position of the swim bladder, it gives the fish lateral stability. In some fishes, the sound is produced by expelling air from the swim bladder through the pneumatic duct and mouth. Since water is a much better carrier of sound waves than air, fish sounds may reach sizable distances. The swim bladder in some species, mainly freshwater fishes (common carp, catfish, bowfin) is connected with the inner ear of the fish directly or way of Weberian ossicles from the Weberian apparatus. These bones can carry the vibrations to the sensory cells present in the internal ear. They are suited for detecting sound and vibrations due to its low density in comparison to the density of the fish’s body tissues. The swim-bladder is also known to act as a resonator. It intensifies the vibra­tions of sound and transmits these to the ear through the Weberian ossicles. This disease is also known as swim bladder disorder or flip over, is a common ailment in aquarium fish. Swim bladder disorder occurs when a fish’s swim bladder, which normally inflates and helps the fish stay properly afloat, becomes compromised. A fish with swim bladder disorder can float nose down tail up or can float to the top or sink to the bottom of the aquarium. Fancy goldfish are among the fish most commonly affected by this disorder. 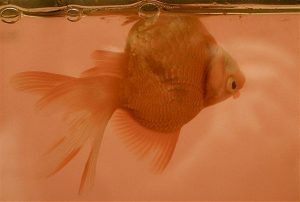 A Ryukin goldfish with swim bladder disease. It can be seen floating upside down due to this disease. The disease may be caused by intestinal parasites or by constipation induced by high nitrate levels from overfeeding. To counter constipation, green peas can be fed to the affected fish. Steele, John H et al. Encyclopedia Of Ocean Sciences. 2nd ed., Elsevier, 2009. DEHADRAI, PADMAKAR V. “RESPIRATORY FUNCTION OF THE SWIMBLADDER OF NOTOPTERUS (LACÉPÈDE)”. Proceedings Of The Zoological Society Of London, vol 139, no. 2, 2009, pp. 341-357. Wiley, doi:10.1111/j.1469-7998.1962.tb01834.x. “Swim Bladder | Fish Anatomy”. 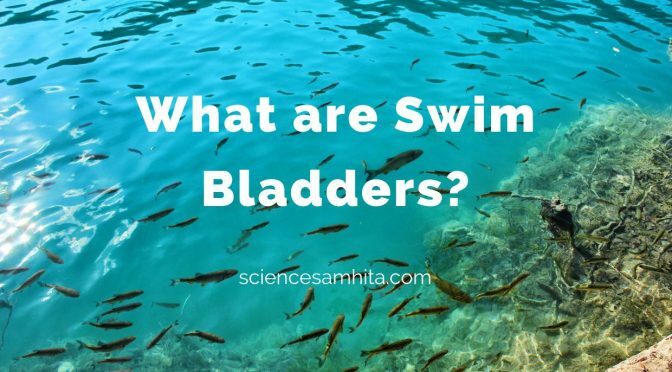 Encyclopedia Britannica, 2018, https://www.britannica.com/science/swim-bladder. Previous PostWhat is Periderm in Plants?​Next PostWhat is Speciation?